Released only in Japan, Dynamic Country Club is a golf game that initially came out in the Arcades two years earlier. The intro features some grainy, sepia-like footage of professional golfers and it doesn't give a great first impression! The game has a number of options available including Tournament, Stroke Play, Match Play and Foursome. You can select which clubs you want to take with you as well as the type of golf ball (which affects things like the amount of distance / spin) and your preferred caddie. The audio commentary once you see the course flyover is excellent but the camera is choppy and doesn't give you a clear view of the layout. Thankfully there's an overhead view on the right-hand-side as well as options for selecting your tee up point and stance. One annoying thing is that when you're ready to take a shot and adjust your aim it can take up to TWO seconds for the game to register! You then select your club, judge the wind and then hit the C button to start and stop the power metre / spin. You really have to over compensate for the wind as it seems to have a huge impact. Putting is similar to other golf games with the wireframe overlay to show the contours of the green; weirdly, the ball shudders along when putting but I do like that the camera shifts to show a close-up view of the hole. The graphics are bland with little detail and it's difficult to pick out individual trees due to the lack of outlining or shading. The in-game music is good but if you decide to turn it off the game ends up feeling lifeless as there's no ambient noise. In terms of SFX, I have no idea why the ball makes a thud sound on every surface as if it's hitting concrete! Dynamic Country Club is definitely feature packed but it's also very mundane with dull, bland gameplay. 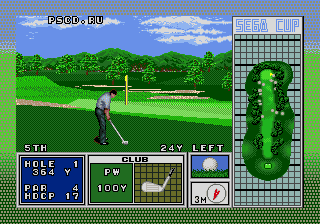 My advice is to stick to the PGA Tour Golf series on the Mega Drive / Genesis. Random trivia: The Arcade version was released on the Sega System 24 board; other games to use this board were Gain Ground (1988) and Bonanza Bros. (1990).